So the chart informs us that for this 3 month period, the whole world had its third warmest year out of the last 140 years! 2016 was a full 0.27℃ hotter on average over those 90 days. Well, maybe not, because the error range is given as +/- 0.15℃. So the difference this year from the record year 2016 might have been only a few 0.01℃, and no way you could have noticed that. In fact where I live in Montreal, it didn’t seem like a warm year at all. 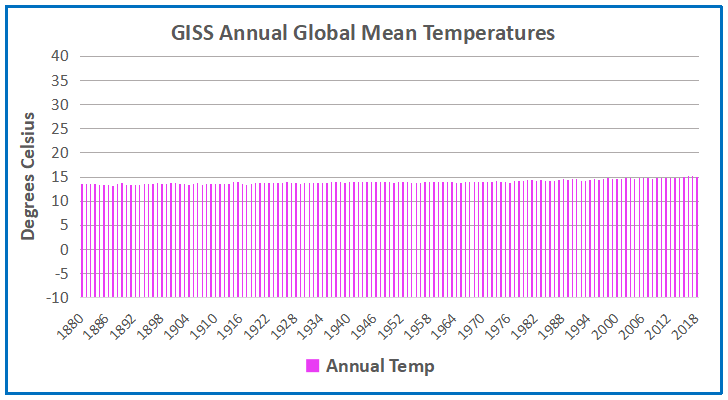 McKitrick also makes the point that claiming a country like Canada warmed more than twice the global average proves nothing. In a cooling period, any place on land will cool faster than the global surface which is 71% ocean. 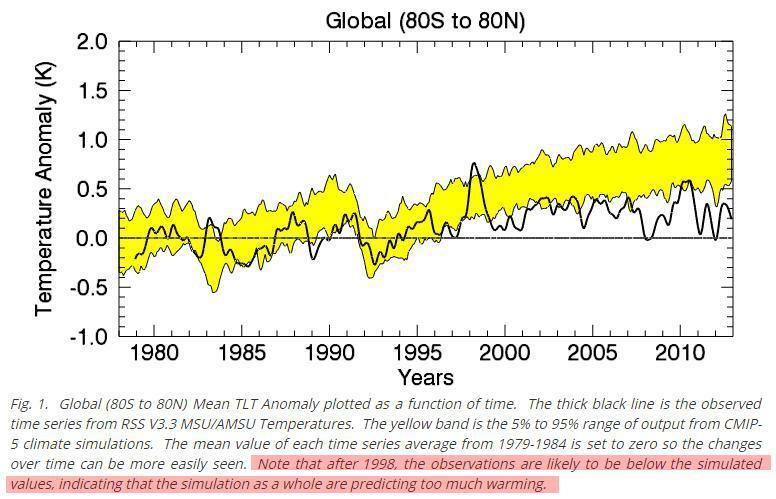 Same thing goes for warming: land temps change faster. For example, consider NOAA’s first quarter report on the major continents. 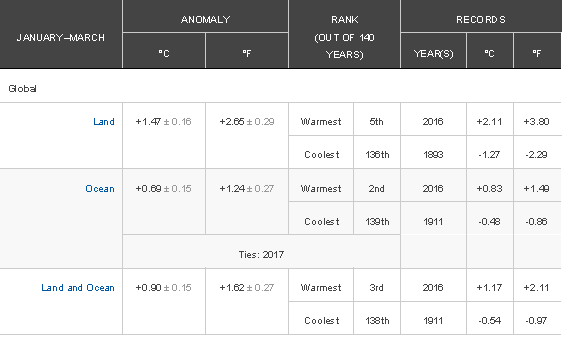 Surprise, surprise: North American temperatures ranked 38th out of 110 years, more than 2℃ cooler than 2016. That’s more like what I experienced, though many days were much colder. And browse the list of other land places: it was not that warm anywhere except for Oceania, with the land mass mostly in Australia. Global warming/climate change is one of those everywhere, elsewhere phenomena. Taking masses of temperatures and averaging them into a GMT (Global Mean Temperature Anomaly) is an abstraction, not anyone’s reality. And in addition, minute changes in that abstraction are too small for anyone to sense. Yet, modern civilization is presumed to be in crisis over 1.5℃ of additional warming, which we apparently already got in Canada and we are much better for it. 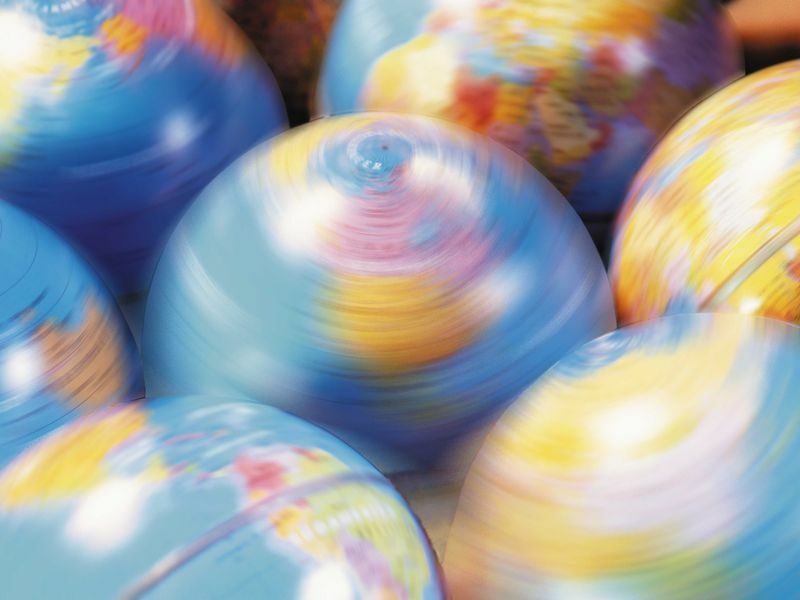 Some people worry Global Warming is changing how fast the Earth spins. Have you noticed? But as we argued a few years ago, declaring a climate emergency invokes a state of exception that carries many inherent risks: the suspension of normal governance, the use of coercive rhetoric, calls for ‘desperate measures’, shallow thinking and deliberation, and even militarization. To declare an emergency becomes an act of high moral and political significance, as it replaces the framework of ordinary politics with one of extraordinary politics. In contrast, a little less rhetorical heat will allow for more cool-headed policy development. What is needed is clear-headed pragmatism, but without the Sword of Damocles hanging over these heads. Climate Pragmatism calls for accelerating technology innovation, including nuclear energy, for tightening local air quality standards, for sector-, regional- and local-level interventions to alter development trajectories and for major investments in improving female literacy. Not desperate measures called forth by the unstable politics of a state of emergency, but right and sensible things to do. And it is never too late to do the right thing. We deal with lots of changes over time. Go back to Bengtsson’s thought experiment. Today’s 80-year-olds entered their teens in 1950. Ask them what changes they experienced over their lives and they will have plenty to say. Then ask if, where they live, the fall warmed more than spring did. Without peeking at the answer, most will have no idea. Yet, according to the federal government’s latest report, depending on the province, one likely warmed twice as fast as the other. Which one? If you can’t tell without looking it up, that’s the point. Postscript: No one under 20 years old has experienced a trend of warming temperatures. Yet they are in the streets instead of classrooms demanding action (anything) to stop something they have never known. Think about it. Footnote: The obsession with a slight rise in average temperatures in the last 100 years is all the more remarkable for taking that warming totally out of context. Any warming is good, even this small amount seen in the context of a year in the life of a typical American. Moreover, the details of the statistics reveal that the rise is the result of cold months being warmer, while hotter months have cooled very slightly. 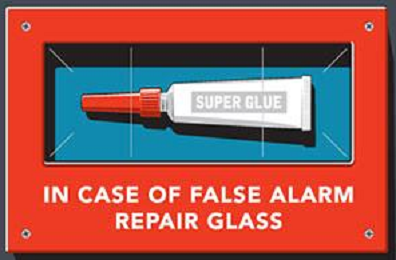 False Alarm. 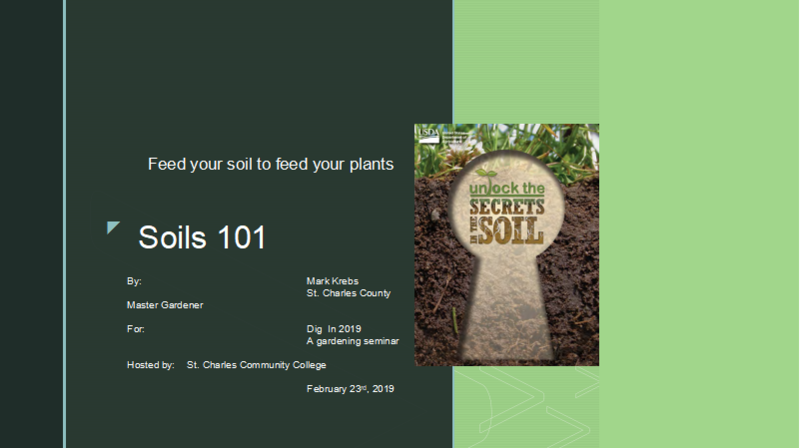 Soils, however, can act as both sources and sinks of carbon, depending upon management, biomass input levels, micro-climatic conditions, and bioclimatic change. Substantially more carbon is stored in the world’s soils than is present in the atmosphere. The global soil carbon (C) pool to one-meter depth, estimated at 2500 Pg C, of which about 1500 Pg C is soil organic carbon (SOC), is about 3.2 times the size of the atmospheric pool and 4 times that of the biotic pool. An extensive body of research has shown that land management practices can increase soil carbon stocks on agricultural lands with practices including addition of organic manures, cover cropping, mulching, conservation tillage, fertility management, agroforestry, and rotational grazing. 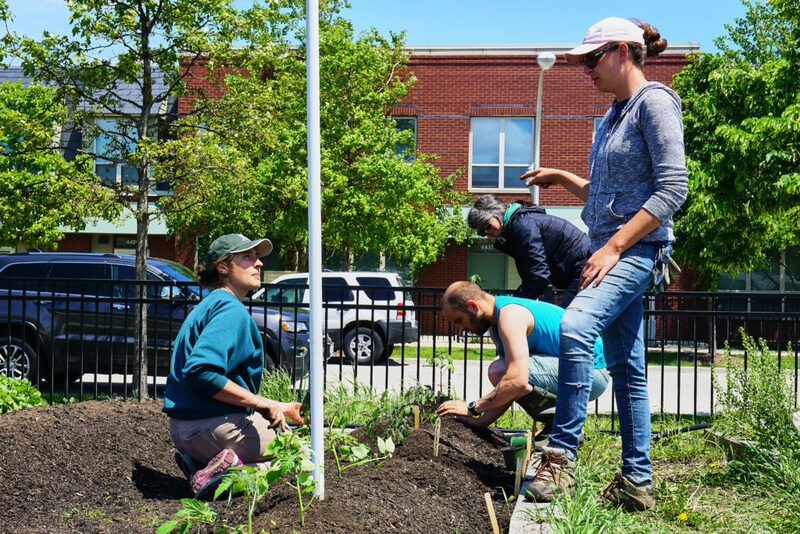 There is general agreement that the technical potential for sequestration of carbon in soil is significant, and some consensus on the magnitude of that potential. This diagram of the fast carbon cycle shows the movement of carbon between land, atmosphere, and oceans in billions of tons per year. 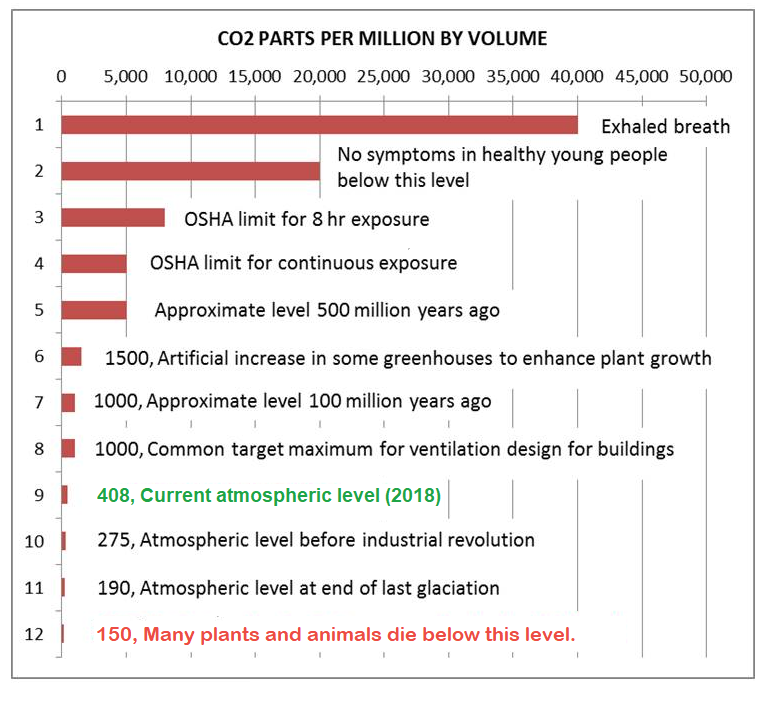 Yellow numbers are natural fluxes, red are human contributions, white indicate stored carbon. 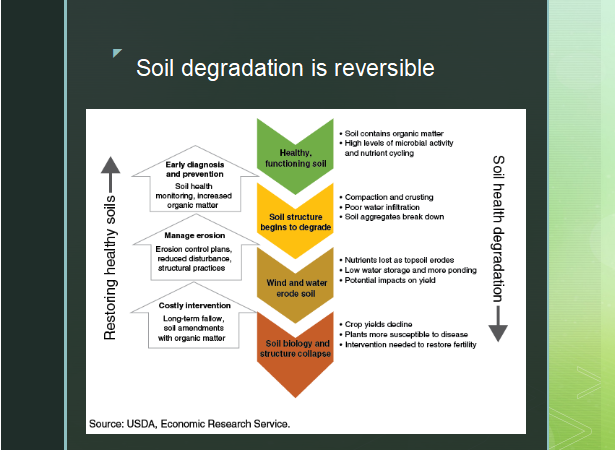 An implicit basic assumption is that in general, 50 to 70% of soil carbon stocks have been lost in cultivated soils, such that the SOC status of almost all cultivated soils can be increased. It is expected that these cropped soils will be able to sequester carbon for at least 20 years before reaching saturation points and new SOC equilibriums, while meta-analysis of field studies suggests that in some instances significant sequestration can continue for 30 or even up to 40 years before reaching new equilibriums. Numerous studies are referenced at the NIPCC chapter on CO2, Plants and Soils. While our knowledge of the biosphere CO2 sink is incomplete, much is known to scientists and the information points not to alarm but to opportunity. The surplus CO2 from burning fossil fuels represents an occasion for us to assist nature to replenish soils depleted of the carbon content plants need to achieve their potential. Excerpts in italics with my bolds. Warming has produced bumper crops most everywhere. 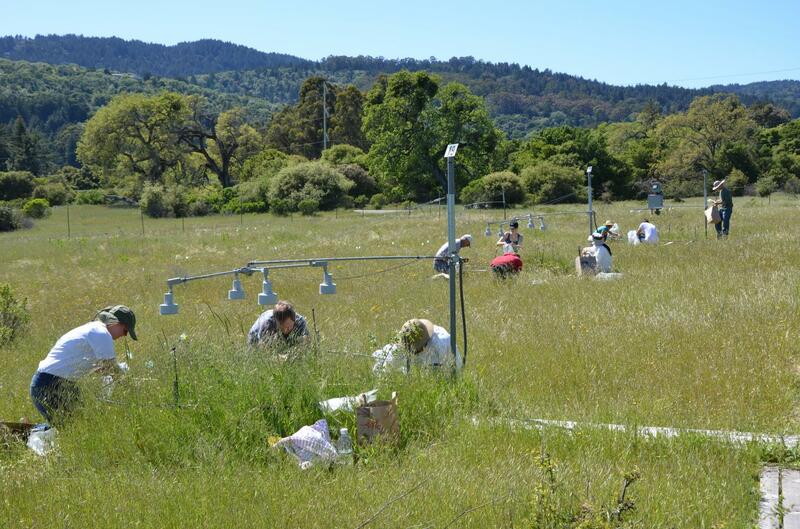 Jasper Ridge outdoor laboratory at Stanford. 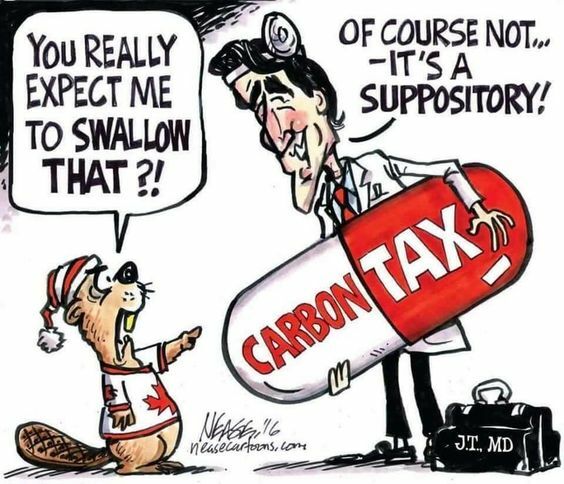 Just in time for the Trudeau carbon tax taking effect, we have all the media trumpeting “Canada Warming Twice as Fast as Global Rate–Effectively Irreversible.” That was written by some urban-dwelling climate illiterates who are woefully misinformed. Let’s help them out with some facts surprising to people who don’t get out much. Unfortunately ignored this week was an informative CBC publication that could have spared us “fake news” spewing across the land, from Bonavista to Vancouuver Island, as the song says. Surprising Facts About Canada are presented in a CBC series 10 Strange Facts About Canada’s Climate Excerpts below provide highlights in italics with my bolds. Canada is as tall as it is wide, creating a wide range of climate conditions. Canada has the largest latitude range of any country on the planet. Our southern border lies at the same latitude as northern California, while our northern edge reaches right to the top of the world. It’s rarely the same season in the same place at the same time. In early April, the Arctic may still be in the throes of a frigid winter, while the south can experience summer-like temperatures. No doubt, our weather forecasters are the busiest in the world! Canada has an ‘iceberg alley’. Pieces of glaciers from the coast of Greenland are picked up by the Labrador Current, a counter-clockwise vortex of waters in the North Atlantic Ocean. Those broken pieces become icebergs that float in the sea off northeast Newfoundland where Fogo Island lies. Navigating the area is risky for ships; in fact this is where the mighty Titanic sank in 1912. But it’s a boon to tourism. Iceberg seekers flock to the area to watch (safely) from the shore and boast about drinking 10,000-year-old fresh water taken from an iceberg floating in the ocean. It’s certainly not surprising to most Canadians that we are tied with Russia for the title of ‘coldest nation in the world.’ Over our vast country, we have an average daily temperature of -5.6C. This is deadly cold. More of us — about 108 — die from exposure to extreme cold than from any other natural event. And that’s not counting Canadian wildlife who are more susceptible to Canada’s icy climate than we are. 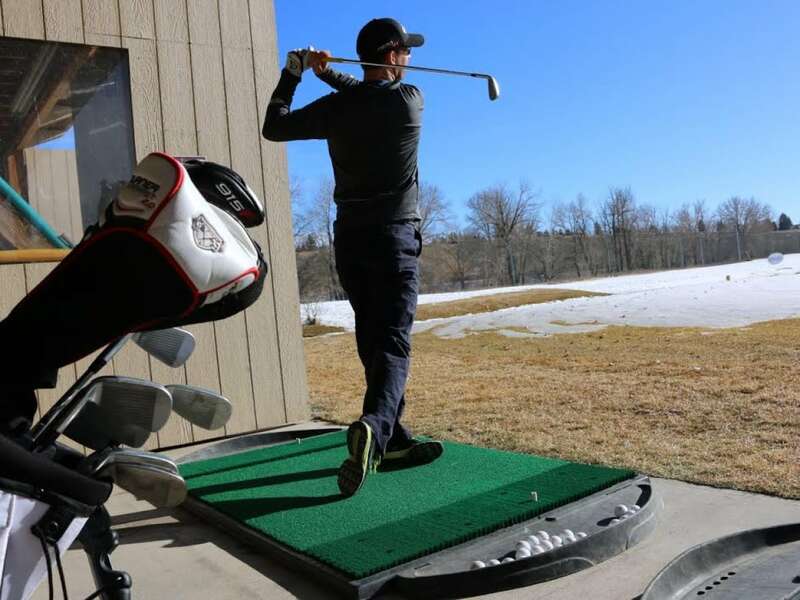 Calgary Golfer February 9, 2016. Every winter, southern Alberta is the ‘Chinook’ capital. For six months — from November to May — warm dry winds rush down the slope of the Rocky Mountains towards southern Alberta. Often moving at hurricane-force speeds of 120 km per hour, they can bring astonishing temperature changes and melt ice within a couple of hours. In 1962 Pincher Creek saw a record temperature rise of 41C, from -19 to 22 in just one hour. Chinook is also known as the ‘ice-eater’ among locals who appreciate the break from winter that the winds provide. Newfoundland is the foggiest place in the world. At the Grand Banks off Newfoundland, the cold water from the Labrador Current from the north meets the warmer Gulf Stream from the south. The result is a whopping 206 days of fog a year. In the summer, it’s foggy 84 per cent of the time! 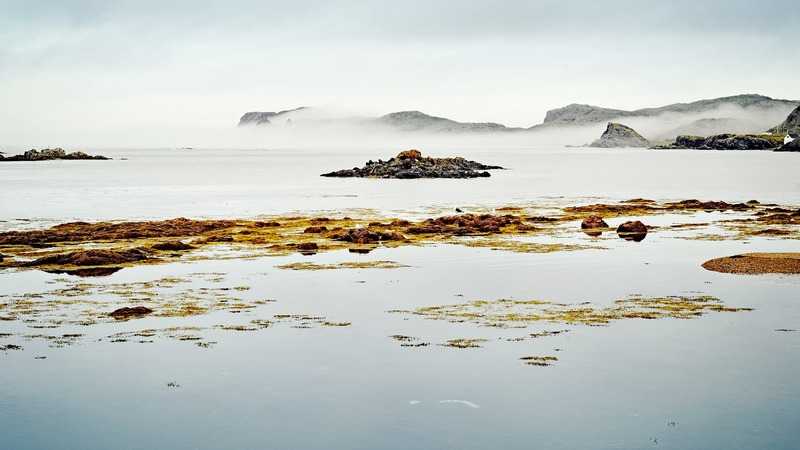 It’s also the richest fishery in the world, the fog is a serious hazard to ships in the region. Aerial view of the Haughton-Mars Project Research Station (HMPRS) on Devon Island, Nunavut, Arctic Canada is shown in this undated handout image. Canada’s North is very cold and dry with very little precipitation, ranging from 10-20 cm a year. Temperatures average below freezing most of the year. Together, they limit the diversity of plants and animals found in the North. And it’s huge: this polar desert covers one seventh of Canada’s total land mass. In 1816, Canada didn’t have a summer. If winter in Canada weren’t bad enough, in 1816 the country’s eastern population were sledding in June and thawing water cisterns in July. Trees shed their leaves and there were reports of migratory birds dropping dead in the streets. Over in Europe, the weird weather stoked anti-American sentiment. People opposed to emigration said that North America was inhospitable and getting colder every year. Representation of Mount Tambora 1815 eruption in Indonesia. Ironically, as eastern Canada stayed cool, the Arctic warmed, creating flotillas of icebergs off the coasts of Nova Scotia and Newfoundland. At the time, it was thought that the icebergs were the cause of the cooling, like a giant glass of iced lemonade. What was the real reason? In 1815, the Tambora volcano erupted in Indonesia, spewing tonnes of ash and dust into the air. Less sunlight reached the earth and this caused the planet’s surface to cool. The volcanic eruption changed the climate in different ways around the world, but Eastern Canadians were treated to the summer that just didn’t come. The Prairies face brutal temperature extremes. It’s no surprise that Regina, Saskatchewan — which lies smack in the middle of Canada’s prairies — lays claim to both the country’s lowest recorded temperature, -50C on January 1, 1885 and the highest, 43.3C on July 5, 1937. Without the moderating effects of a large body of water, Canada’s Prairies are vulnerable to some of the worst weather Canada has to offer. 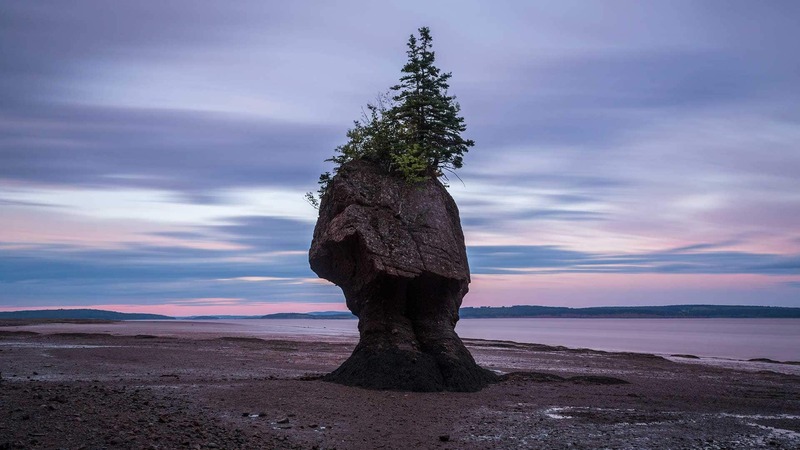 The Bay of Fundy has the largest tides in the world. Twice each day, 160 billion tonnes of seawater flow in and out of this small area in Nova Scotia — more than the combined flow of the world’s freshwater rivers. The tides reach a peak of 16 metres (as high as a five-storey building) and take about six hours to come in. The most extreme tides in the Bay occur twice each month when the earth, moon and sun are in alignment and together they create a larger-than-usual gravitational pull on the ocean, creating a “spring tide” (not to be confused with the season spring). Windsor is the thunderstorm capital of Canada. Hot, humid air from the Gulf of Mexico funnels up through Windsor and the Western Basin of Lake Erie creating the perfect conditions for thunderstorms. About 251 lightning flashes per 100 square kilometres happen every year when small pieces of frozen raindrops collide within thunderclouds. 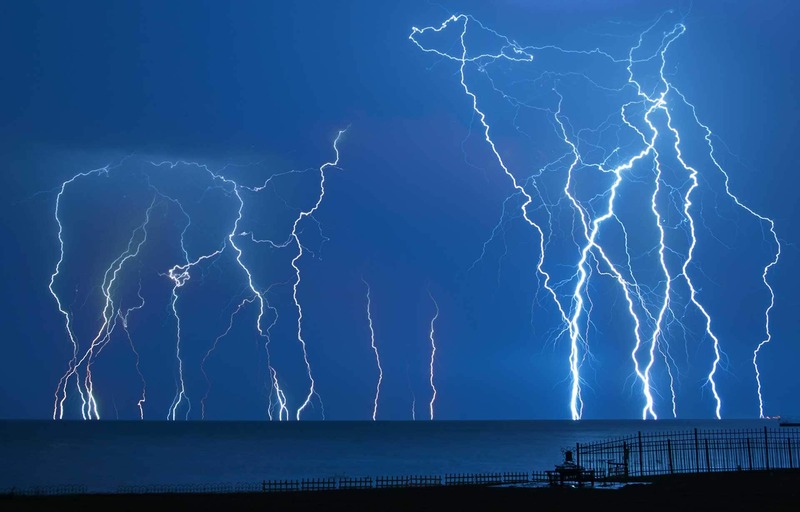 The clouds fill with electrical charges that are eventually funnelled to the ground as lightning. With all that going on, all the variety of temperature, precipitation, weather events and seasonalities, no one noticed it had warmed much, and would be grateful if it had. With all the alarms sounding about the Arctic meltdown in the last decades, let’s consider the best long-service stations in the far north. Update April 10, 2019 March AMO Results now available and included in Decadal graph below. This graph shows monthly AMO temps for some important years. The Peak years were 1998, 2010 and 2016, with the latter emphasized as the most recent. 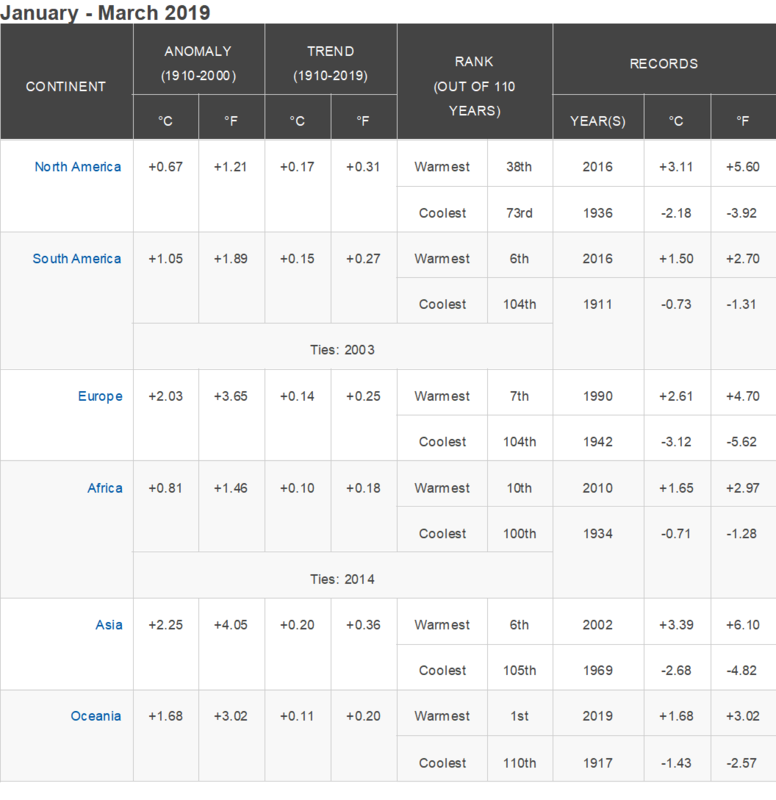 The other years show lesser warming, with 2007 emphasized as the coolest in the last 20 years. Note the red 2018 line is at the bottom of all these tracks. 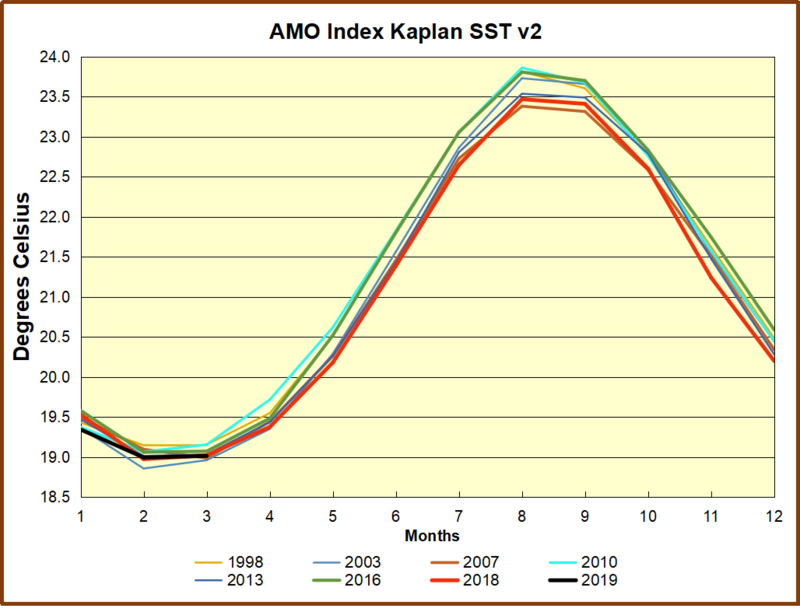 The short black line shows that 2019 began slightly cooler than January 2018 The February average AMO matched the low SST of the previous year, 0.14C lower than the peak year February 2017. March 2019 is also slightly lower than 2018 and 0.06C lower than peak year March 2016. 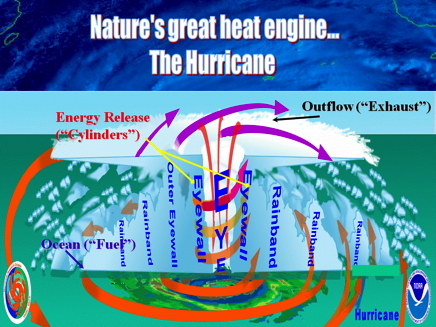 Earth climate systems functions as a massive heat engine. Now we have a publication discussing progress in applying the latter approach using thermodynamic concepts in the effort to model climate processes.. The article is A new diagnostic tool for water, energy and entropy budgets in climate models by Valerio Lembo, Frank Lunkeit, and Valerio Lucarini February 14, 2019. Overview in italics with my bolds. The routine receives as inputs energy fluxes at surface and at the Top-of-Atmosphere (TOA), for the computation of energy budgets at Top-of-Atmosphere (TOA), at the surface, and in the atmosphere as a residual. Meridional enthalpy transports are also computed from the divergence of the zonal mean energy budget fluxes; location and intensity of peaks in the two hemispheres are then provided as outputs. Rainfall, snowfall and latent heat fluxes are received as inputs for computing the water mass and latent energy budgets. If a land-sea mask is provided, the required quantities are separately computed over continents and oceans. The diagnostic tool also computes the Lorenz Energy Cycle (LEC) and its storage/conversion terms as annual mean global and hemispheric values. In order to achieve this, one needs to provide as input three-dimensional daily fields of horizontal wind velocity and temperature in the troposphere. Two methods have been implemented for the computation of the material entropy production, one relying on the convergence of radiative heat fluxes in the atmosphere (indirect method), one combining the irreversible processes occurring in the climate system, particularly heat fluxes in the boundary layer, the hydrological cycle and the kinetic energy dissipation as retrieved from the residuals of the LEC. 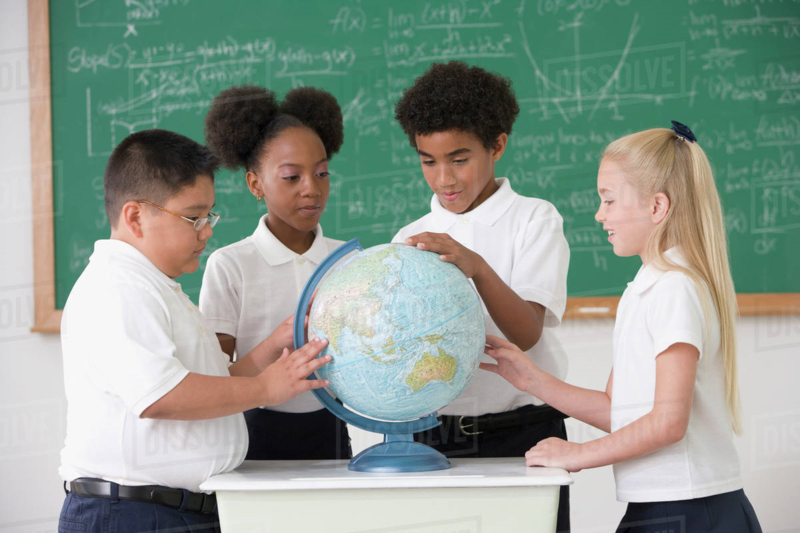 A version of the diagnostic tool is included in the Earth System Model eValuation Tool (ESMValTool) community diagnostics, in order to assess the performances of soon available CMIP6 model simulations. The aim of this software is to provide a comprehensive picture of the thermodynamics of the climate system as reproduced in the state-of-the-art coupled general circulation models. This can prove useful for better understanding anthropogenic and natural climate change, paleoclimatic climate variability, and climatic tipping points. Energy: Rather than a proxy of a changing climate, surface temperatures and precipitation changes should be better viewed as a consequence of a non-equilibrium steady state system which is responding to a radiative energy imbalance through a complex interaction of feedbacks. 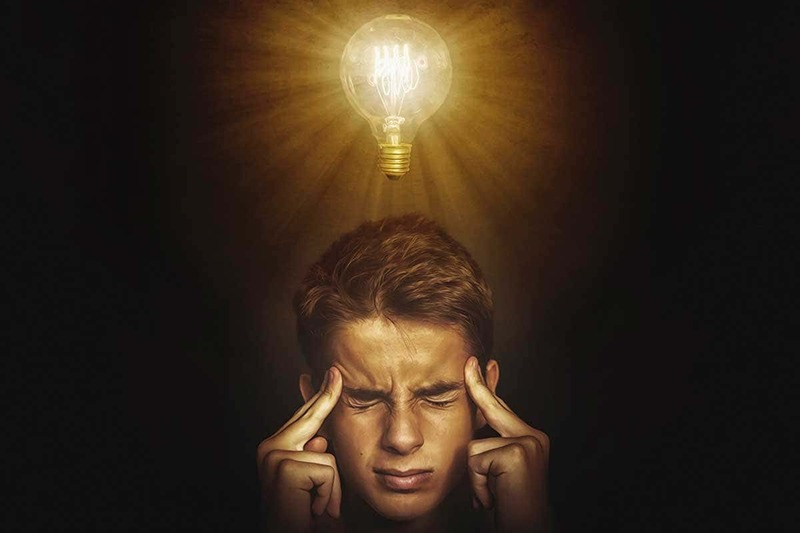 A changing climate, under the effect of an external transient forcing, can only be properly addressed if the energy imbalance, and the way it is transported within the system and converted into different forms is taken into account. 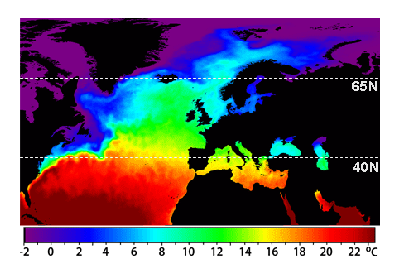 The models’ skill to represent the history of energy and heat exchanges in the climate system has been assessed by comparing numerical simulations against available observations, where available, including the fundamental problem of ocean heat uptake. Heat Transport: In order to understand how the heat is transported by the geophysical fluids, one should clarify what sets them into motion. We focus here on the atmosphere. A comprehensive view of the energetics fuelling the general circulation is given by the Lorenz Energy Cycle (LEC) framework. This provides a picture of the various processes responsible for conversion of available potential energy (APE), i.e. the excess of potential energy with respect to a state of thermodynamic equilibrium, into kinetic energy and dissipative heating. Under stationary conditions, the dissipative heating exactly equals the mechanical work performed by the atmosphere. In other words, the LEC formulation allows to constrain the atmosphere to the first law of thermodynamics, and the system as a whole can be seen as a pure thermodynamic heat engine under dissipative non-equilibrium conditions. Water: On one hand the energy budget is relevantly affected by semi-empirical formulations of the water vapor spectrum, on the other hand the energy budget influences the moisture budget by means of uncertainties in aerosol-cloud interactions and mechanisms of tropical deep convection. A global scale evaluation of the hydrological cycle, both from a moisture and energetic perspective, is thus considered an integral part of an overall diagnostics for the thermodynamics of climate system. Entropy: From a macroscopic point of view, one usually refers to “material entropy production” as the entropy produced by the geophysical fluids in the climate system, which are not related to the properties of the radiative fields, but rather to the irreversible processes related to the motion of these fluids. Mainly, this has to do with phase changes and water vapor diffusion. Lucarini (2009) underlined the link between entropy production and efficiency of the climate engine, which were then used to understand climatic tipping points, and, in particular, the snowball/warm Earth critical transition, to define a wider class of climate response metrics, and to study planetary circulation regimes. A constraint has also been proposed to the entropy production of the atmospheric heat engine, given by the emerging importance of non-viscous processes in a warming climate. The goal here is to look at models through the lens of their dynamics and thermodynamics, in the view of enunciated above ideas about complex non-equilibrium systems. The metrics that we here propose are based on the analysis of the energy and water budgets and transports, of the energy transformations, and of the entropy production. It seems that climate modelers are dealing with a quandary: How can we improve on the unsatisfactory results from climate modeling? B.Start over from scratch applying non-equilibrium maths to the turbulent climate, though this branch of math is immature with limited expertise. In other words, we are confident in classical maths, but does climate have features that disqualify it from their application? We are confident that non-equilibrium maths were developed for systems such as the climate, but are these maths robust enough to deal with such a complex reality? It appears that some modelers are coming to grips with the turbulent quality of climate due to convection dominating heat transfer in the lower troposphere. Heretofore, models put in a parameter for energy loss through convection, and proceeded to model the system as a purely radiative dissipative system. Recently, it seems that some modelers are striking out in a new, possibly more fruitful direction. Herbert et al 2013 is one example exploring the paradigm of non-equilibrium steady states (NESS). Such attempts are open to criticism from a classical position, but may lead to a breakthrough for climate modeling. Here’s how Herbert et al address the issue of a turbulent, non-equilibrium atmosphere. Their results show that convection rules in the lower troposphere and direct warming from CO2 is quite modest, much less than current models project. “Like any fluid heated from below, the atmosphere is subject to vertical instability which triggers convection. Convection occurs on small time and space scales, which makes it a challenging feature to include in climate models. Usually sub-grid parameterizations are required. Here, we develop an alternative view based on a global thermodynamic variational principle. We compute convective flux profiles and temperature profiles at steady-state in an implicit way, by maximizing the associated entropy production rate. Two settings are examined, corresponding respectively to the idealized case of a gray atmosphere, and a realistic case based on a Net Exchange Formulation radiative scheme. In the second case, we are also able to discuss the effect of variations of the atmospheric composition, like a doubling of the carbon dioxide concentration. In this modeling paradigm, we have to move from a linear radiative Energy Budget to a dynamic steady state Entropy Budget. As Ozawa et al explains, this is a shift from current modeling practices, but is based on concepts going back to Carnot. “Entropy of a system is defined as a summation of “heat supplied” divided by its “temperature” [Clausius, 1865].. Heat can be supplied by conduction, by convection, or by radiation. The entropy of the system will increase by equation (1) no matter which way we may choose. When we extract the heat from the system, the entropy of the system will decrease by the same amount. Thus the entropy of a diabatic system, which exchanges heat with its surrounding system, can either increase or decrease, depending on the direction of the heat exchange. This is not a violation of the second law of thermodynamics since the entropy increase in the surrounding system is larger. Carnot regarded the Earth as a sort of heat engine, in which a fluid like the atmosphere acts as working substance transporting heat from hot to cold places, thereby producing the kinetic energy of the fluid itself. His general conclusion about heat engines is that there is a certain limit for the conversion rate of the heat energy into the kinetic energy and that this limit is inevitable for any natural systems including, among others, the Earth’s atmosphere. Thus there is a flow of energy from the hot Sun to cold space through the Earth. In the Earth’s system the energy is transported from the warm equatorial region to the cool polar regions by the atmosphere and oceans. Then, according to Carnot, a part of the heat energy is converted into the potential energy which is the source of the kinetic energy of the atmosphere and oceans. Thus it is likely that the global climate system is regulated at a state with a maximum rate of entropy production by the turbulent heat transport, regardless of the entropy production by the absorption of solar radiation This result is also consistent with a conjecture that entropy of a whole system connected through a nonlinear system will increase along a path of evolution, with a maximum rate of entropy production among a manifold of possible paths [Sawada, 1981]. 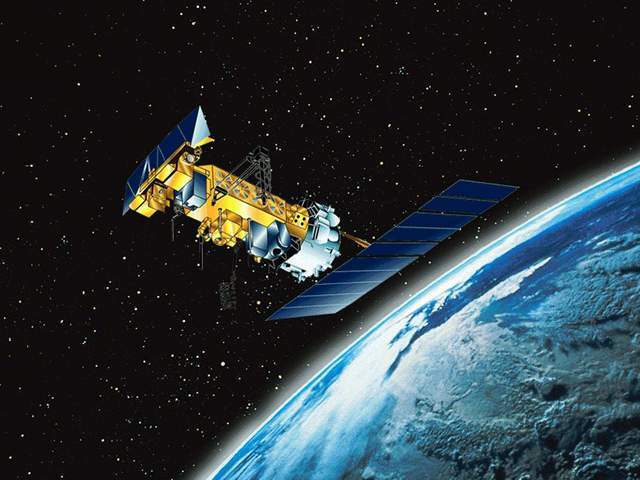 We shall resolve this radiation problem in this paper by providing a complete view of dissipation processes in the climate system in the framework of an entropy budget for the globe. Mark Hendrickson writes at The Epoch Times March 28, 2019 Open Letter to a Journalist About His Paper’s Position on Climate Change Mark patiently lays out information and context for someone to think more deeply about superficial opinions on global warming/climate change. Excerpts in italics with my bolds and added images. Last month, in your introductory remarks to The Christian Science Monitor Daily online news stories, you addressed the issue of the Monitor’s coverage of climate change. Your challenge is how to report when you and your Monitor colleagues believe that “human emissions of CO2 are triggering dangerous climatic conditions” while some of your readers do not. You wrote, “Part of good journalism is to seek out a range of viewpoints rather than just present a story through one lens. But a corollary journalistic responsibility is to weigh the credibility and relevance of viewpoints.” I agree wholeheartedly, and I hope you will follow through in fairly reporting opinions with which you may personally disagree. Your statement that there is a “strong consensus within the climate science profession that human emissions are now the leading factor affecting changes in Earth’s climate” is almost correct, but not quite. Some climate skeptics object to the use of the word “consensus.” They state (correctly, I believe) that “consensus” is more appropriate in politics, where majorities shape reality, than in science, where what a majority may believe to be true today may be disproven tomorrow. You, however, used the word “consensus” correctly, because your supporting hyperlink takes the reader to a story about the political consensus that has been forged at the U.N. through the reports of the IPCC. 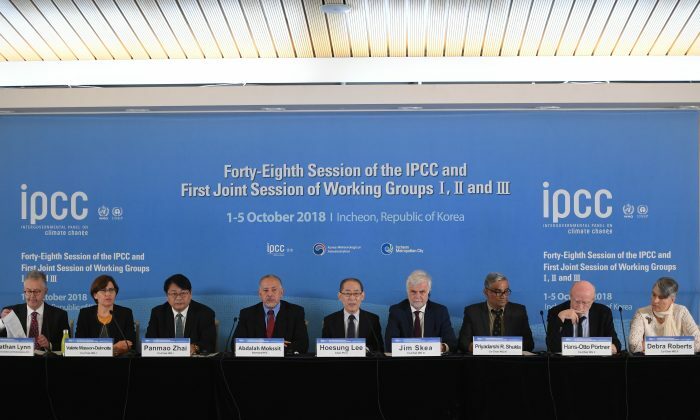 It is important to understand that the IPCC is a political organization (after all, it is the Inter-governmental Panel), not a scientific body. I can cite a number of quotes from scientists who have done work for the IPCC, but disagreed with the published “consensus.” The political nature of the IPCC and its reports is underscored by Appendix A of the Principles Governing IPCC work. It authorizes the few dozen political appointees who actually write the Summary for Policymakers to alter what scientists have written in order to conform to what the Summary states. Hundreds of peer-reviewed articles every year differ from the official pronouncements of the IPCC. There is not so much a “strong consensus within the climate science profession” in general that human activity is causing a dangerous climate as there is a “strong consensus” within the extensive but not all-encompassing government-employed climate science clique. Journalists often ask those who dissent from the official position of the IPCC if they receive or have received remuneration from fossil fuel companies. The ugly insinuation, of course, is that a person receiving compensation from a conventional energy company is automatically suspected of being a paid propagandist. Is it not equally as plausible that a scientist funded by government grants might tailor his findings so as not to risk losing a valuable source of income? There should be symmetry here, treating people on both sides of the issue with equal respect, instead of proceeding from the unfounded assumption that those receiving money from nongovernmental sources are not trustworthy while those receiving government funds are. Regarding your assertion that “human emissions are now the leading factor affecting changes in Earth’s climate.” That assertion would have more credibility if it were proven that carbon dioxide is, in fact, the principal driver of global temperatures. 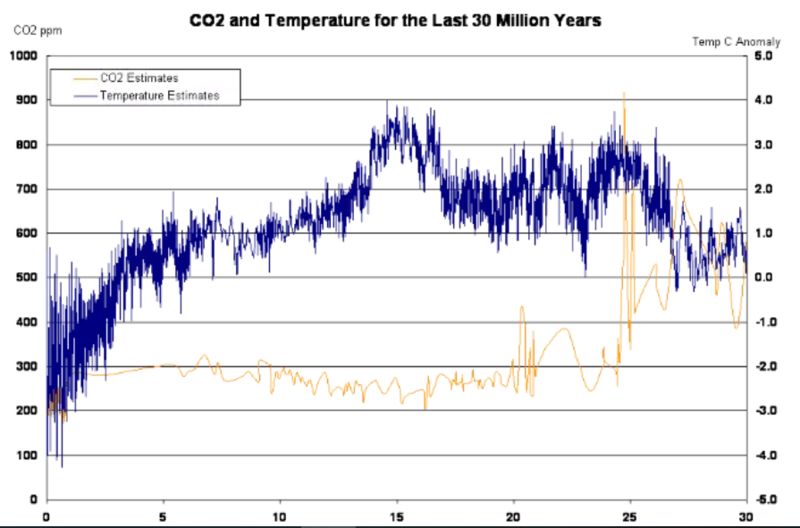 However, when one looks at the historical record, one encounters a couple of inconvenient facts: 1) over hundreds of millions of years, graphs plotting global temperatures and atmospheric CO2 show no fixed relation or meaningful correlation; 2) the Vostok ice core graph shows the two variables following similar paths over the past several hundred thousand years, but with changes in CO2 lagging behind changes in temperature by 800 to 1,000 years, and effect cannot precede cause in a temporal universe. Space prevents me from discussing other unresolved issues—the numerous measuring limitations and errors; the logarithmic scale of how much heat CO2 can “trap”; the fact that CO2 concentrations before the modern increase were dangerously low (plant life would cease to exist if the concentration fell much below 150–170 ppm, whereas it will flourish optimally nearer 1,000 ppm); whether warmer temperatures, on the whole, are better or worse for humans than cold. I would urge the Monitor’s reporters to not rely so heavily on the scientists employed by the IPCC. Very subtly, the dangerous perception has set in that these are “the best scientists in the world.” I am not saying that there aren’t many fine scientists employed by Uncle Sam and contracted for by the IPCC, but to assume that if the government employs them, that stamps them as the best is unfounded. 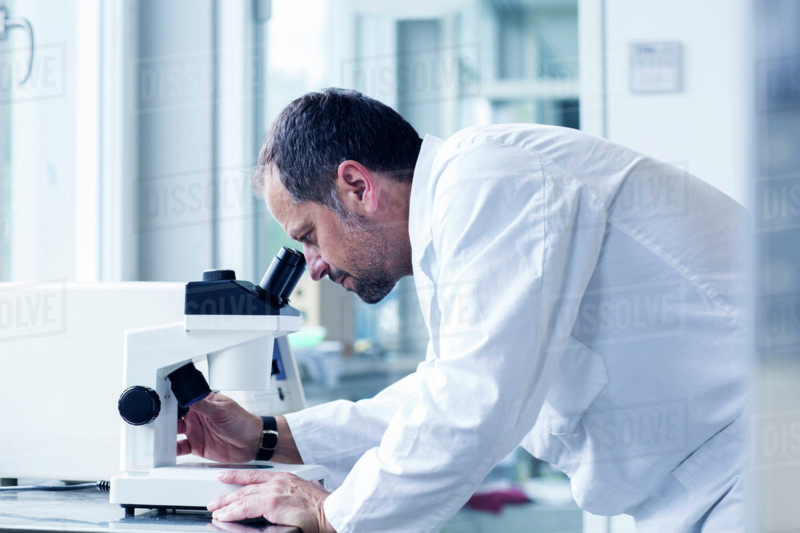 Politicians have no special power to identify which scientists’ output comes closest to the truth, but they are shrewd enough to pick scientists whose work can be used in support of pre-determined political agendas. I hope none of your reporters is allied with the Society of Environmental Journalists—a group dedicated to censoring dissent. It does appear that your principal environmental reporter has become over-reliant on the eminently quotable Dr. Katherine Hayhoe, director of the Climate Science Center at Texas Tech University, and a lead author for the IPCC. Brilliant! Unfortunately, it is also disingenuous. Skeptics about the catastrophist scenario aren’t rejecting the basic laws of physics; they don’t deny that Earth’s climate is volatile; they don’t deny that CO2 is a greenhouse gas or that human consumption of fossil fuels is increasing its concentration in the atmosphere. There remain important disagreements about the degree of climate change, the impact those changes will have, whether any benefits that can be gained by retooling our lives would exceed the costs of making those changes, and other issues with public policy implications that need to be studied and discussed. I hope that the Monitor will contribute to these needed discussions by reporting today’s minority positions as well as the most popular ones. The video above gives you in 20 minutes the viewpoint of William Happer, a key scientific advisor to the Trump Administration. H/T Elephant’s Child and Tallbloke.